The routing protocol Open short path first called in short OSPF is an Open standard described in RFC 2328. 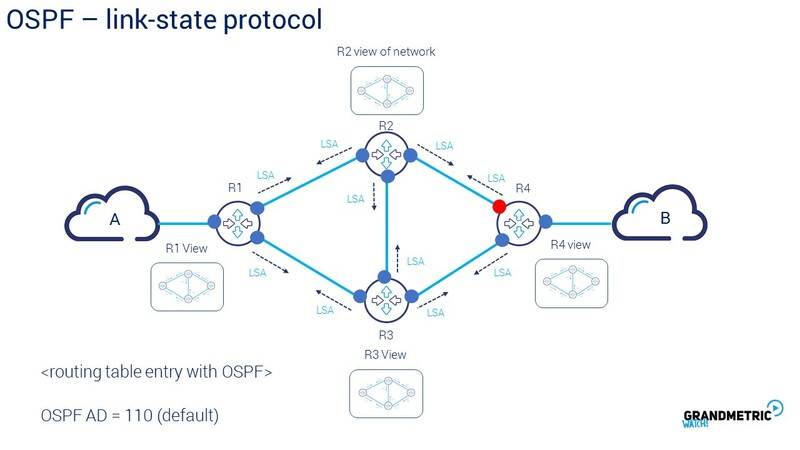 That is of course important message because you now know that OSPF can be implemented in multi-vendor environment and is not limited to single vendor platform implementation. Contrary to RIP which is distance vector protocol where the metric is purely hop count the OSPF is a Link-State Protocol : and the cost is taken from link metric. 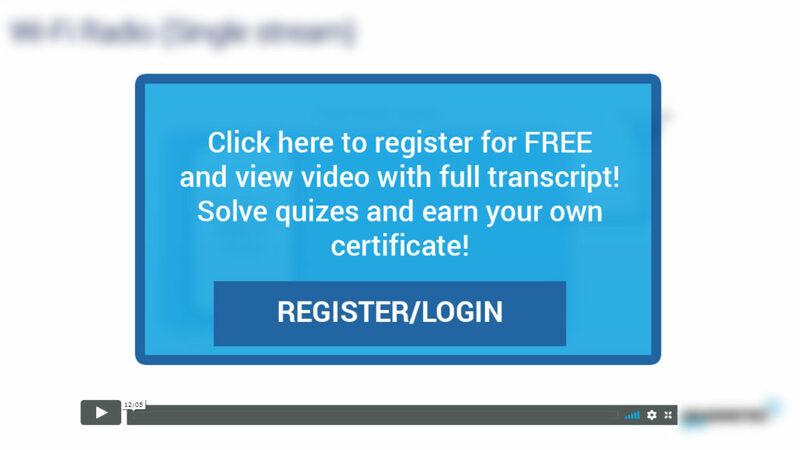 You can imagine the link as an interface of router. Each interface being part of OSPF has own cost. What is so specific for link state protocol , each router speaking OSPF has whole topology view. Based on that it calculates the optimal path to destination network. OSPF as a link state is very quiet protocol in communication meaning that the updates flood the network only when there is a change, contrary to for example RIP where the updates about whole routing table flow every 30 second between RIP neighbors. Speaking about the routing table, the OSPF routing entry is marked with O letter and has default AD of 110. The cost, sometimes called metric is derived from link bandwidth parameter by default. Cost is inversely proportional to banwidth on the interface as on equation. So 10 Megs link will have higher ospf cost than 1 Gig link which is logical. Higher cost is worse and lower is preffered. This is default cost calculation behavior. However, there are sometimes situations that links between the routers are equal in terms of bandwidth and it is not preffered to change the bandwidth value. Instead we can optionally set the ip ospf cost parameter on interface level to influence the ospf metric. 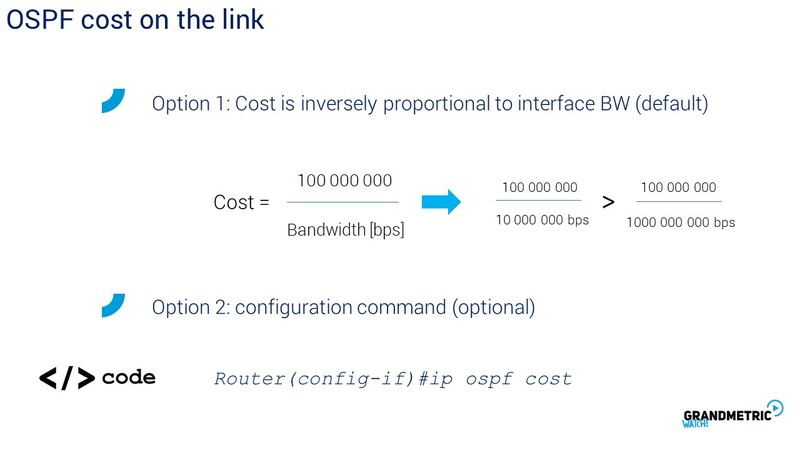 If ip ospf cost is set this has the priority in ospf cost calculation over the bandwidth value. When we know how the ospf cost is derived we can look at the whole OSPF topology. 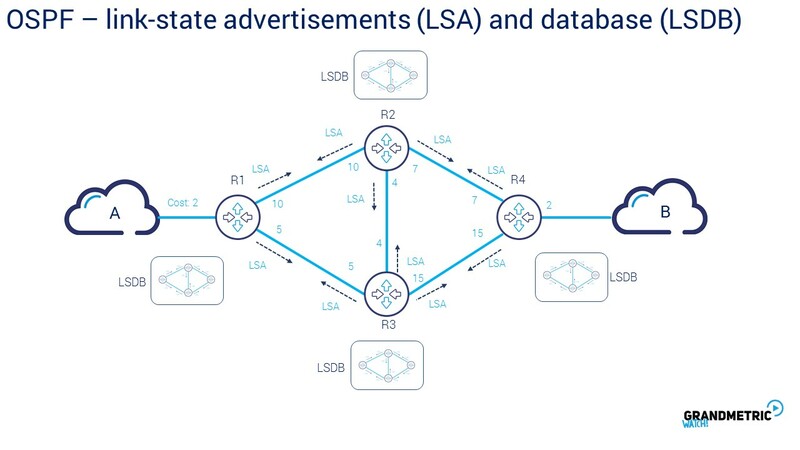 All ospf rouuters send the messages called link state advertisemnt in these LSA messages the routing updates are sent along with cost for reaching particular network from particular router. Thanks to this each router in ospf domain builds its own link state database. The link state database shows every possible paths to destination network along with interface costs. Because every router has its own topology view for whole network the path calculation is done on each router in ospf domain. This naturaly requires more CPU overhead for path computation in comparison to other distance vecotr protocols where the whole metric to destination is already prepared when coming from neighbor. This fact of CPU utilization increase for path computation some time ago was the factor of OSPF elimination in routing protocol choosing proces. However, novadays when routers supporitng OSPF are stronger CPU, the factor is no longer taken into account. As said , thanks to LSDB information each router calculates its own most optimal path. The most optimal path computation is done according to Dijkstra algorithm. Algoirthm developed by a dutch profesor of mathematics looks for the shortest path in the graph between nodes. If we imagine that these nodes are represented by routers , it is perfectly suitable for routing purposes. 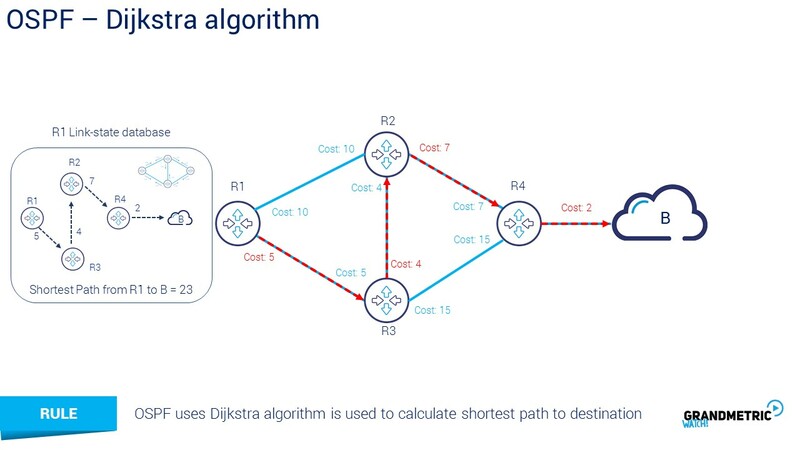 OSPF uses Dijkstra on each ospf router finidng optimal paths. At the picture we can see routers with interfaces and costs of those interfaces. R1 has link state database and based on this calculates the path to network B. Look that most optimal patch leads the way via r3 and r2 in spite of the fact that it is 3 hops way from destination instead of two – but the costs mather here.